A recent report published by Infinium Global Research on drilling machine market provides in-depth analysis of segments and sub-segments in the global as well as regional drilling machine market. The study also highlights the impact of drivers, restraints, and macro indicators on the global and regional drilling machine market over the short term as well as long term. The report is a comprehensive presentation of trends, forecast and dollar values of global drilling machine market. According to the report, the global drilling machine market is projected to grow at a CAGR of 6.80% over the forecast period of 2019-2025. The drilling machine is a tool used for drilling, reaming, spot facing, tapping holes, countersinking and counterboring in the solid materials such as woods, metals or others. Drilling machines are available in different shapes and sizes, from small hand-held power drills to bench mounted and finally floor-mounted models. The hand-feed drilling machine is the simplest and most common type of drilling machines in use today. It is light duty machines that are hand-fed by the operator, using feed handle. Additionally, Drilling Dig is a mechanical machine that drill water wells, oil wells, or natural gas extraction wells. 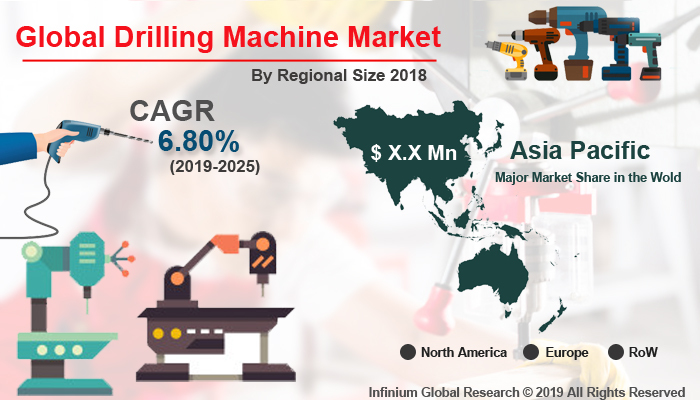 Rising demand in the end-user industries such as automotive, aerospace, electrical and electronics, oil & gas and others across the globe are the major drivers accelerating the demand of Drilling machine market. Moreover, increasing demand for the fabricated metal product is another key factor contributes to the growth of the market. This is because fabricated metals products are widely used in construction and manufacturing. Additionally, growing drilling operation across the globe that has a positive impact on the growth of drilling machine market. However, fluctuation of raw material costs could hamper the growth of drilling machine market. Furthermore, the growth in infrastructural development in developing countries coupled with technological advancement in manufacturing equipment is anticipated to offers significant growth opportunities for the drilling machines market throughout the forecast period. Going further, government initiatives regarding the machine tools industry that will have a positive impact on the growth of this market in the coming years. Geographically, the Asia Pacific region held a major share in the drilling machine market and is projected to grow with the highest CAGR during the forecast period. This is growth is mainly due to the rapid industrialization and growth in various end-user industries such as automotive, manufacturing industries and many others. Moreover, China is expected to be the major contributor in the Asia Pacific region, where augmented manufacturing activities that create the need to produce tools and equipment. Moreover, Constructional development in the several sectors such as residential, commercial, institutional and public works and electric utilities augments the growth of drilling machine market in the Asia Pacific region. North America is anticipated to have a substantial growth rate during the forecast period owing to the recent innovations made by drilling technology. Moreover, the growth in constructional activities in U.S. region promotes the growth of Drilling machine market in the North America region. However, the European region is projected to stabilize its growth in the drilling machine market. The report on global drilling machine market covers segments such as types, and end user. On the basis of types, the sub-markets include portable drilling machine, sensitive or bench drilling machine, upright drilling machine, radial drilling machine, gang drilling machine, multiple spindle drilling machine, deep hole drilling machine, and automatic drilling machine. On the basis of the end user, the sub-markets include automotive, aerospace, marine, electrical and electronics, military & defense, oil & gas, and others. The report provides profiles of the companies in the market such as HSIN GEELI HARDWARE ENTERPRISE CO., LTD, ERNST LENZ Maschinenbau GmbH, Dalian Machine Tool Group Corporation, DATRON AG, DMG MORI, Fehlmann AG, Cameron Micro Drill Presses, Gate Machinery International Limited, and ALPEN-MAYKESTAG GmbH. The report provides deep insights into the demand forecasts, market trends, and micro and macro indicators. In addition, this report provides insights into the factors that are driving and restraining the growth in this market. Moreover, The IGR-Growth Matrix analysis given in the report brings an insight into the investment areas that existing or new market players can consider. The report provides insights into the market using analytical tools such as Porter's five forces analysis and DRO analysis of drilling machine market. Moreover, the study highlights current market trends and provides forecast from 2019-2025. We also have highlighted future trends in the market that will affect the demand during the forecast period. Moreover, the competitive analysis given in each regional market brings an insight into the market share of the leading players.